Interstate 84 has eight active business routes across Idaho and northern Utah and a pair of decommissioned routes. Business Loop I-84 connects the cities of Caldwell and Nampa along a 13.50 mile route following old U.S. 30. The route arcs southwest along Centennial Way from Exit 27 to the one-way couplet of Cleveland Boulevard south and Blaine Street north through Downtown Caldwell. Traffic recombines along Cleveland Boulevard as the commercial arterial leads southeast from Linden Street to Homedale Road and the Nampa city limits. Advancing eastward, big box retail anchored by Karcher Mall lines Business Loop I-84 (Caldwell Boulevard) to Midland Boulevard in north Nampa. A second carriageway split then takes place east of Canyon Street, with 2nd and 3rd Streets carrying six lanes of traffic to Downtown. 11th Avenue angles the business loop northeast, but motorists along eastbound must navigate one block further along 3rd Street to 12th Avenue north and 2nd Street west to continue due to 11th Avenue flowing south from 2nd Street. Garrity Boulevard takes Business Loop I-84 east from the Nampa street grid to an industrial area northwest of Nampa Municipal Airport (MAN). The route concludes by Nampa Gateway Center at Exit 38. The Boise business route was decommissioned in the 1980s in favor of the Interstate 184 (formerly Interstate 180N) spur from the west and U.S. 20-26 (Broadway) from the east. This business route used to be routed between Exits 49 and 54 from Interstate 84. Mountain Home represents the largest city between Boise and Twin Falls. There Business Loop I-84 branches southward from Exit 90 to run along old U.S. 30 to the city center. Within the business district, Business Loop I-84 separates with traffic eastbound following Main Street and westbound along 2nd Street. The east leg of the route follows American Legion Boulevard from Idaho 51 to Exit 99, where U.S. 20 splits with I-84 east. ITD inventories the Mountain Home Business Loop with 5.931 miles. The route is amply sign per a drive along the route in August 2016. This business route forms an L-shaped route south from Exit 112 to Old U.S. 30 and east along old U.S. 26 & 30 to a half diamond interchange at Exit 114. A handful of businesses line the 3.178 mile route as it connects I-84 with Idaho 78 west to Bruneau. Traveling just 1.425 miles, Business Loop I-84 runs along Bannock Street south and 1st Avenue east through the Glenns Ferry city center. The route starts at a half diamond interchange (Exit 120) to the west and ends between separate sections of old U.S. 26 & 30 at Exit 121. 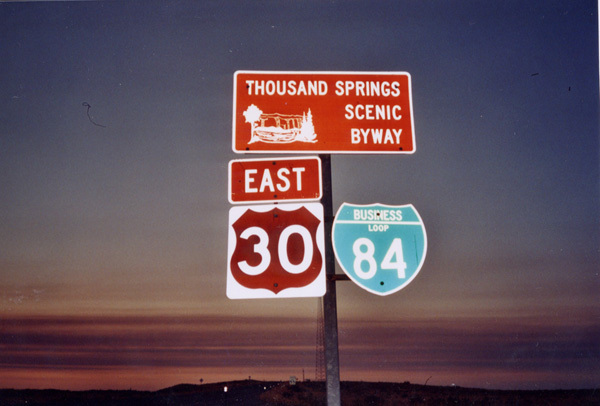 U.S. 30 follows most of the 3.518 mile business route through Bliss as I-84 bypasses the city to the north. Business Loop I-84 & U.S. 30 wind southeast from Exit 137 to the modest street grid of the city, where just a handful of services remain. The two routes part ways just west of Exit 141, where U.S. 26 also leaves Interstate 84 for Gooding. The 6.56 mile route of Business Loop I-84 joins the freeway with the Cassia County seat of Burley south from Exit 208 and the Minidoka County city of Heyburn southwest of Exit 211. The portion on Overland Avenue doubles as Idaho 27 south along a commercial arterial to U.S. 30 (Main Street) in Downtown Burley. U.S. 30 takes the business route east to Idaho 81 and Burley Municipal Airport (BYI), where the tandem turn northward to span the Snake River ahead of the industrial east side of Heyburn. U.S. 30 east overlaps with I-84 to I-86 from the business route end while Idaho 24 north begins en route to Rupert. Drove the Burley #Idaho I-84 Business Loop. Several classic motel signs thru downtown while the west side is a typical commercial arterial. Business Loop I-84 branches east from Exit 40 of I-84 along side SR 102 (Main Street) through the Tremonton city center and south with SR 13 to Interstates 15 & 84 at Exit 376. Business Loop I-15 joins the 5.8 mile loop from 1000 West and the Box Elder County Fairgrounds to the south end in the town of Elwood. 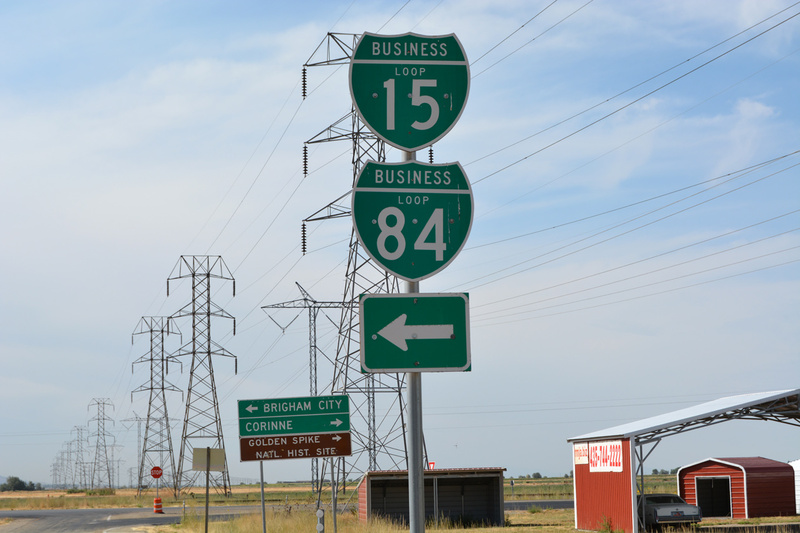 Business Loop I-84 follows the historic routing of U.S. 30S, which was replaced by Interstate 80N northwest to Idaho. The intersection where the routes turn south from SR 102 to SR 13 (5200 West) is the former south end of U.S. 191, predecessor to I-15 between Tremonton and Pocatello, Idaho. Unsigned from the Interstates 15 & 84 mainline, the Brigham City business route loops east from Exits 362 and 365. 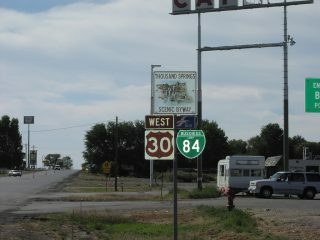 The south end of the loop is also the southern terminus of U.S. 91. The route east from the DDI with 1100 South to U.S. 89 and SR 13 (Main Street) is not signed as Business Loop I-15 & 84. Shields however appear along Main Street north to the city center. 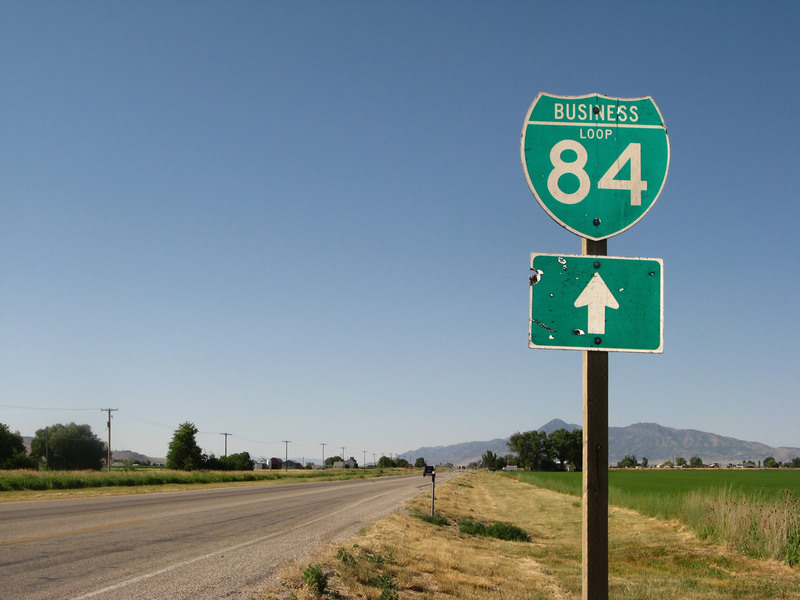 The westward turn to I-15 & 84 along SR 13 is also unsigned, but shields were noted in August 2016 for Business Loops I-15 & 84 on the southbound off-ramp from the freeway. The Business Loop Policy for Interstate Highways enacted by Utah on April 30, 1973 specified a number of cities that qualified for new routes. Included in those listed was Morgan.1 The potential business loop from then I-80N may have used SR 66 at the split diamond interchange (Exit 103) with 300 North and 600 East. A second business loop outlined in the 1973 Business Loop Policy adopted by Utah could have been designated from I-80N at the town of Henefer.1 The likely route would run along SR 86 and SR 65 along Main Street (old U.S. 30S) between Exits 112 and 115.
Business Loop I-84 used to run south from Exits 9 and 10 to the Fairfield County town of Newtown. The route followed Connecticut 25 south to its overlap with U.S. 6 on Mt. Pleasant Road and Main Street (old U.S. 202) east to the Newtown business district. Turning left at the famous Newtown flagpole, the business route remained along side U.S. 6 on Church Hill Road east back to Interstate 84. 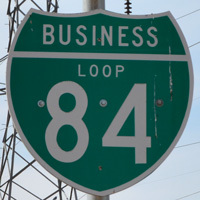 This information comes from Bob Bailin, who recollected that the business loop was eliminated in the late 1970s after the former U.S. 6 expressway was upgraded to Interstate 84. Michael Summa however observed an auxiliary sign in each direction of I-84 for Exit 10 displaying Business Spur I-84 with small button copy shields in the 1970s. These were accompanied by wooden reassurance markers posted along U.S. 6 west to Connecticut 25 at Main Street in Newtown. It is possible that the relocation of U.S. 202 away from Newtown may have coincided with the decommissioning of the I-84 business route. Business Loop I-84 and U.S. 30 combine west through the rural city of Bliss, Idaho. 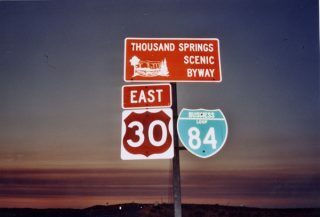 Note that this is also the Thousand Springs Scenic Byway, which features the Thousand Springs in the Hagerman Valley west of Bliss via U.S. 30. Photo taken by Jake Bear (10/07/12). Idaho formerly posted brown and white shields to represent scenic U.S. and state highways. This set was posted on the business loop to Bliss. Photo taken by Zach Maillard (08/00). Trailblazers for Business Loops I-15 south & 84 east posted after the SR 13 intersection with 10400 North at Elwood, Utah. Photo taken 07/13/08.